Big Jay McNeely (born Cecil James McNeely, April 29, 1927, Watts, Los Angeles, California, United States) is an American rhythm and blues saxophonist. Inspired by Illinois Jacquet and Lester Young, he teamed with his older brother Robert McNeely, who played baritone saxophone, and made his first recordings with drummer Johnny Otis, who ran the Barrelhouse Club that stood only a few blocks from McNeely's home. Shortly after he performed on Otis's "Barrel House Stomp." Ralph Bass, A&R man for Savoy Records, promptly signed him to a recording contract. 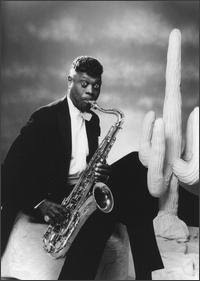 Bass's boss, Herman Lubinsky, suggested the stage name Big Jay McNeely because Cecil McNeely did not sound commercial. McNeely's first hit was "The Deacon's Hop," an instrumental which topped the Billboard R&B chart in early 1949. The single was his most successful of his three chart entries. Thanks to his flamboyant playing, called "honking," McNeely remained popular through the 1950s and into the early 1960s, recording for the Exclusive, Aladdin, Imperial, Federal, Vee-Jay, and Swingin' labels. But despite a hit R&B ballad, "There Is Something on Your Mind," (1959) featuring Little Sonny Warner on vocals, and a 1963 album for Warner Bros. Records, McNeely's music career began to cool off. He quit the music industry in 1971 to become a postman. However, thanks to an R&B revival in the early 1980s, McNeely left the post office and returned to touring and recording full time, usually overseas. His original tenor sax is enshrined in the Experience Music Project in Seattle, and he was inducted into The Rhythm & Blues Hall of Fame.